Pole Fishing kicks off with an exclusive peek inside the state-of-the-art Reglass factory. Learn exactly how a pole is made in this eye-opening article! 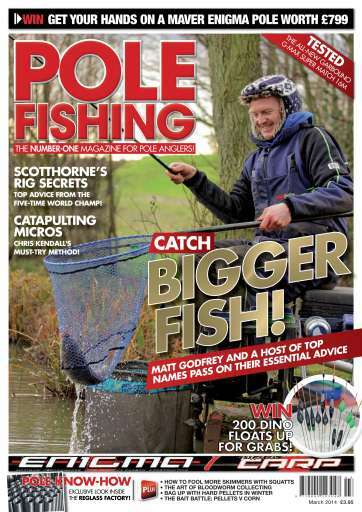 We also get inside the mind of a five-time world champion, as Alan Scotthorne explains the fine art of rig making. 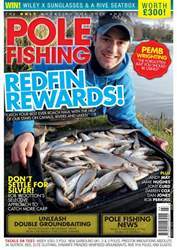 You can also see exactly where bloodworm comes from, as Ed Warren dons his chest waders and goes scraping in a secret pool for the 'little red men'. 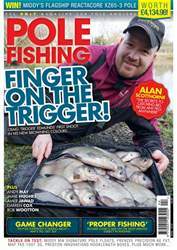 Meanwhile, Chris Kendall unveils a very clever way to feed micro pellets that's sure to increase your catches, while Stu Redman lifts the lid on the awesome pulling power of fluorescent bait! 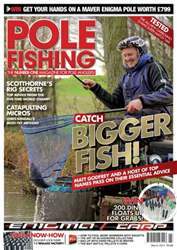 If it's canals you like, you're in for a treat, because Tommy Boyce, Richard Chave and Attila Adam show you how to keep catching in the cold. We also spotlight three amazing river swims and the tactics you need to plunder them. 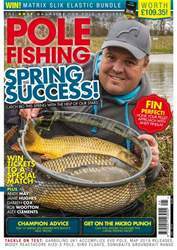 Plus, we look at how squatts could transform your stillwater skimmer catches, while Matt Godfrey and Jon Arthur go head to head to see if feeding joker can outscore more traditional baits. There is also a first look at Garbolino's latest 16m masterpiece and we unveil some very tasty little items in the latest gear guide. This and a whole lot more await you in the March issue – so get downloading!